You are here: Home / Damp / Rising Damp – the inevitable rise of moisture through masonry. 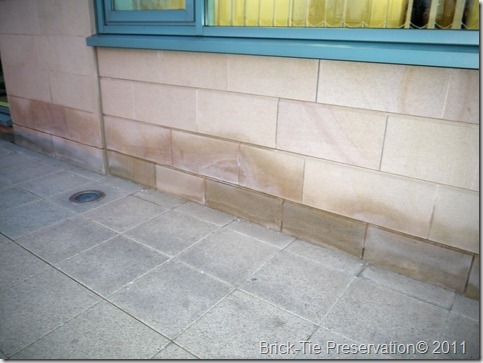 Rising Damp – the inevitable rise of moisture through masonry. Our houses are built from stone or brick, usually bonded in cement or lime mortar. These materials soak up water, whether from the exposed surface when it rains or from the ground, after all, they are embedded in the soil. Rain is sporadic and interspersed with sunshine and wind, so the effects of rainwater penetration are mitigated to some extent by the evaporation cycle. Cavity walls are the modern way of almost totally eliminating penetrating damp. Rising damp though, is different for several reasons. The ground gets wet when rain falls, but evaporation is reduced by a number of factors, including the earth’s ability to soak up lots of water, particularly at the foot of a wall; the ground soaks up not only the rain which falls onto it, but also the rainwater which hits the wall and runs down to the ground or settles there, due to the topography of the site. In the case of ground adjacent to walls, there’s also the soil structure to consider; it’s been dig out to form a foundation and then in-filled again, so it is usually less well compacted than it was was before building commenced; it’s a natural sump, against the building. The upshot of this is that the ground gets very wet and has not fully dried out, before it gets wet once more. As a result, it’s often damp almost all year round. Buildings are built into the ground at the base; surrounded by this damp earth. So the bit of the wall below ground level soaks up this water and becomes quite saturated. Whilst the building material is denser than the soil, it is much more homogenous; bricks or stones in regular bed joints and sometimes quite thick. This means that the capillaries are more continual and smaller. If anything the wall at and below ground level will retain this water with more enthusiasm than the soil it sits in. Whilst less dense materials soak up a larger quantity of water, than dense ones, they also let it go faster too. This is because the smaller pores in dense materials exert relatively more ‘suction’ than larger pores. So the base of the wall is the last thing to dry out – if it ever does in Yorkshire. It’s not all bad news though; the section of the wall above ground level is usually isolated from the base by a physical DPC. Without one of these the material will draw the moisture up the wall – classic rising damp. All the DPC does is offer it’s bitumen or plastic upper face to the wall above, so that the naturally absorbent materials rest upon this dry surface. Below the DPC are pores and capillaries full of moisture, perhaps less that a couple of mm away from the wall above. Now then, what if we remove, damage or bridge the DPC, so that the wall above has a connection to the wall and ground below? Will dampness be drawn up the wall also? The answer is almost always yes. The height depends on many factors but some spread of the moisture is inevitable. This happens slowly at first but will normally accelerate as the building materials ‘age’, the exact reason for this is not fully understood, but new cement mortars are more resistant than very old mortars or lime mortars. Nevertheless, it will happen eventually, as seen on the images above. The top image is from a six year old building – the lower image from a 100 year old building. Look at the top image. It is a six year old prestige office building in Wakefield. The DPC is a heavy duty plastic type and there’s nothing wrong with it. 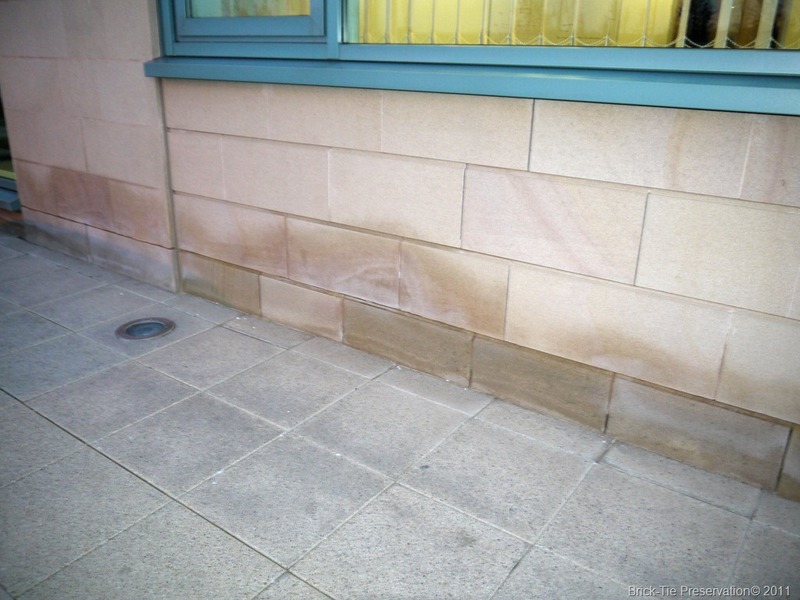 The damage seen in the image is caused by rising damp and rainwater splash at the base of the wall. The DPC is out of view, only 5 to 75mm below the path and resting on a course of engineering brick. The severe damage is confined only to the sections of wall where the path is higher than the DPC; the building is a great example of the negative effects of having the ground even slightly higher than the DPC – bridging it. On other parts of the building, where the ground is just below the DPC level, the damage is very slight because only rainwater splash is involved there. Note that it is stone and the damp is clearly rising up within the stone, crossing the cement bed-joints and concentrating salts in all the materials. It’s hard to se on the image but the stone is already spalling at the base due to the last 6 winters of freeze/thaw cycle. Rising damp is a very common problem because it is a natural consequence of building anything on the damp earth without insulating the building materials from the ground. A DPC is the building’s essential equivalent of a camper’s ground sheet – try sleeping in a tent without one! However, diagnosis is important, so that remedial action is appropriate and effective. There are damp specialists who, having passed an examination called CSRT, can help to establish the cause. Experienced building surveyors can be consulted too. My advice for the client in Wakefield is simple – lower the ground and allow the existing DPC to work properly.